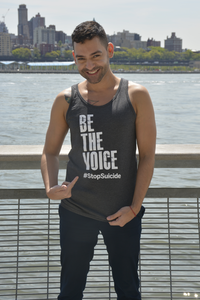 This AFSP unisex tank top in charcoal spreads the messages “Be the Voice” and “#StopSuicide” in white across the front. Perfect for the gym, or anywhere else the “#StopSuicide” message is needed, i.e. everywhere.